The Path captures the allure of the ocean, hypnotically drawing you into its solitude. Alone with your thoughts, the rhythmic waves soothe the spirit. 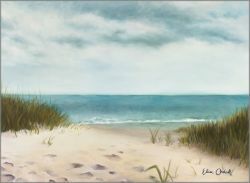 Clouds hint at storms to come, but the timeless ocean endures. Please give me a price for the Elise Ondak - Path, The - ONDPA1.